We offer various multimedia solutions. Corpus Design Studio will visualize and present your ideas and products to your clients in appropriate way. ACE HR Services make employees selection at administrative, expert and middle management level in certain industries, functional disciplines, in the field of sales and high turnover products and in manufacture as well. 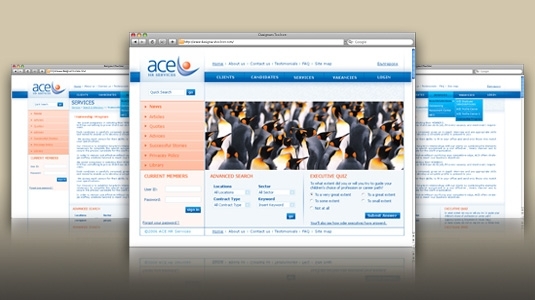 The Corporate Identity for ACE HR Service is developed from the outset. We put in an idea, we created logotype, we worked out all job materials and the whole advertising line as: brochure, card, clock, advertisement packaging bag and car branding. Along with the creation of new corporate identity for ACE HR Services, Corpus Design Studio also elaborated the new corporate company web site.